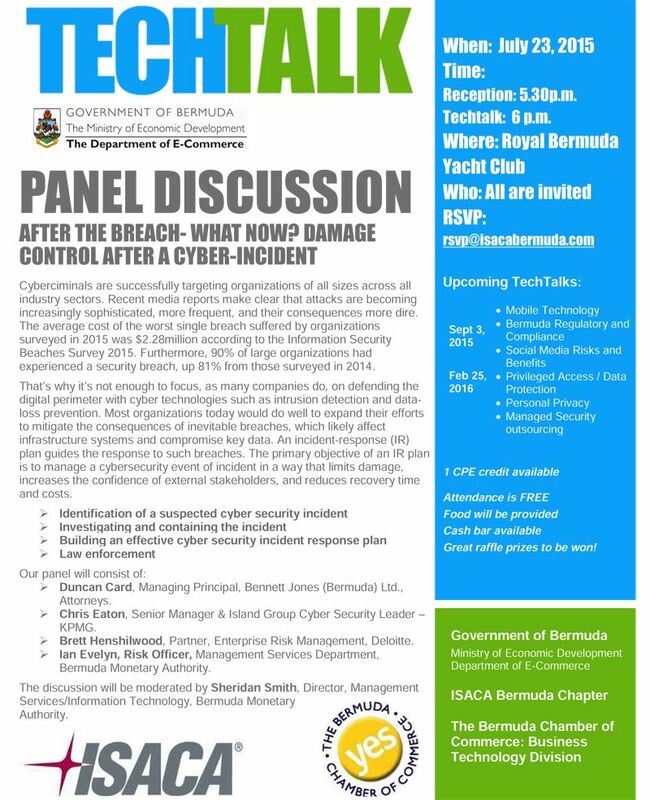 The ISACA Bermuda Chapter will be hosting an upcoming Techtalk with a panel discussion of Cyber Incident Response on Thursday [July 23] at the Royal Bermuda Yacht Club in Hamilton. The discussion will be moderated by Sheridan Smith, Director, Management Services/Information Technology, Bermuda Monetary Authority. Attendance is free, and food will be provided alongside a cash bar and raffle prizes. One CPE credit available. RSVPs can be made to rsvp@isacabermuda.com. ISACA is a nonprofit, global association and engages in the development, adoption and use of globally accepted, industry-leading knowledge and practices for information systems. The ISACA Bermuda Chapter currently has 70 members, many of whom have undertaken ISACA certifications to further their learning and to increase their marketability to employers.